A dated glass plaque hangs on a wall above a desk full of mementos. On it reads “Meet Algonquin’s Newest President” with a photo of Cheryl Jensen attached to it. Promotional college coffee mugs and family photos all lined on the window sills. A book titled Robot-Proof, Higher Education in the Age of Artificial Intelligence is laid out on the desk with planners and endless papers, each one a reminder of daily tasks and appointments. Panoramic views of the Nepean area, lit by sunlight, brightens up the presidential bureau on the top floor of C-building. The walls are covered with various artworks and a once empty office is now turned into an oasis of memories. They’re all signs that show that this is a woman who values knowledge, organization and time management. Despite the bright and airy atmosphere, however, a bittersweet emotion can be sensed as soon as you enter the floor. 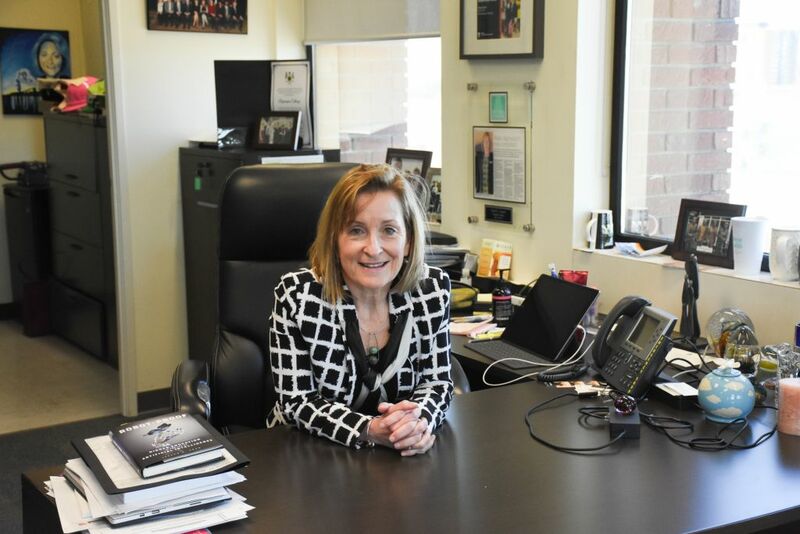 After 40 years of full-time employment, President Cheryl Jensen has announced on March 26, she will be retiring at the end of her five-year contract, in August 2019. “It’s time for me to change priorities a little bit, take a block of time where my husband and I will travel and spend some time with our grand kids and our kids, and then I’ll decide what is important to me and what passions I have to give back to the community,” said Jensen. As the college’s first female president, Jensen has left multiple lasting impressions. Advancements with “Truth, Reconciliation and Indigenization”; building several new partnerships and expanding the college’s academic programs are to name a few. Placing Algonquin on the map and making it a known institution for growing companies was a goal of hers from the start. Jensen admired Algonquin before coming here and felt pride in her position every day for the past five years. “What I wanted to make sure was that pride was felt by everybody. I called myself the chief storyteller; what I knew needed to be done by talking to the community was make sure that all of Ottawa knew about Algonquin, and what we do here. I think that’s been done. I think we’ve got a very strong profile within the city and are seen as a major pillar in city building which is very important,” said Jensen. Initiating the People Plan, a method for personal success and the installation of the DARE District are other staples in her legacy at the college. The news of her retirement came as a shock to the college community. Board of Governors Chair, Peter Nadeau, mentioned he spoke with Jensen about her retiring, yet they hadn’t decided on anything concrete. Another campus leader was just as surprised. “My heart sunk. It is such a bittersweet feeling because she deserves her retirement, but there was always a part of me that wanted her to be there when I walked across the graduation stage. Her leadership and friendship really have been so impactful,” said Deijanelle Simon, Students’ Association president. Senior Vice President, Academic Claude Brulé, knew Jensen before they started working together at Algonquin, and will miss their camaraderie. “We have a saying: It’s family first always, and we knew how important her family is to her, and knowing that her family is at some distance we weren’t surprised she wanted to make those connections stronger,” said Brulé. Jensen’s retirement comes at a time where the college has many issues on its plate: Ontario adjusting its tuition fees, the sexual assaults reported on Canadian campuses and Algonquin’s smoking controversy. A number of faculty members have also taken a voluntary retirement incentive, making this year the largest year of retirees Algonquin’s community has seen. Nadeau shared his concerns about finding a proper candidate for the role. While he has every confidence that the board will put forth Algonquin’s priorities during the selection process, Jensen will be leaving large shoes to fill. “I’m of course concerned that we find the right candidate. Cheryl has made a huge impact (during) her time at Algonquin. Not just the college but the community will feel her departure. So yeah it’s going to be a big job to find the right candidate. I’m confident that the rep that the college has,” said Nadeau. Farewell to the first female president of Algonquin Reviewed by Jessica Alberga on April 7, 2019 .